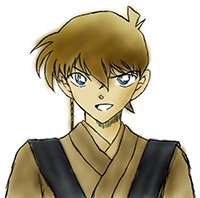 No, it's not the lighting—Shinichi/Conan even called himself "Arthur Hirai" to Ran in the December trailer, so it seems to be a disguise applied to him by Kid. Spoiler pics of 1,029 are now out, and Fujiwara has provided translation: https://imgur.com/a/QPwSONY? And here's a summary, courtesy of Spimer: No break next week—we can expect 1,030 spoilers at this time, next week. I honestly think either Asaka or Tsutomu would have had more windows of opportunity to take it. I guess it depends on whether you think the piece Rumi has is the very same one pried out of Kōji's hand or not—if it is, she's more likely to be Asaka. I have to wonder what prompted him to choose that specific alias—whether he's Rum or not, for him to happen to have an alias that, re-arranged and translated into English, is Rum's catchphrase (at least, it's his catchphrase in the context of these "Hurry up and give me intel on Shinichi Kudō" messages he's sent to Bourbon)... is it just an out-of-universe signal to readers from Gosho, or does the man with this alias have a reason for choosing it? More of a just-to-be-safe measure than anything else. Via deduction? With or without testimony from Rum (again, I'd doubt he'd just tell her about that)? I'd think the only one who'd know about the piece and its significance would be the one who took it from Kōji's dead hand—even if the case info specifies that a Ryuma piece that was there before was missing (assuming they took note of such a fact, of course), the only one who could be certain that it was part of Kōji's message is the one who pried it out of his hand. Honestly? No. I just don't feel comfortable, at this stage, making predictions about this dying message—and that's even if we do, right now, have all the pieces. "Ryuma Carasuma." That's what we seem to have—I don't know how that points to Kanenori Wakita. For that scenario, it would need a very specific time window in order to keep her room from having to be cleaned up by Rum—perhaps after poisoning Amanda, Rum went to silence Asaka (perhaps Rum called Asaka in when Asaka was standing outside). At this point, Kōji just happens to come by—he notices either Rum and Asaka going in the room or notices that no one is outside the room. He elects to then enter the room—and finds Asaka under attack (and likely sees Amanda dead, as well). A surprise attack by Rum near the door, inside the room, would allow there to be physical contact without messing up the room—at the very least, it would keep any potential mess to a minimum. Rum immediately stops and lunges at this witness to his crimes. Kōji runs, but Rum is able to stay right on his heels—this leads Kōji to conclude that he won't outrun Rum, so he makes for his own room, and tries to keep Rum out. At this point, Asaka is either in a haze from Rum's surprise attack, or is unconscious due to it. In the former case, Asaka comes at Rum, only for Rum to take advantage of Asaka's haze and incapacitate them—before he can APTX Asaka, however, he sees Tsutomu running at him. He quickly realizes he has to silence Kōji—now. He breaks in, finally. Kōji sustains defensive wounds before Rum forces APTX down his throat. Tsutomu then barges in and fights Rum. The fight ends with Rum fleeing the scene. In the latter case, Rum sees Tsutomu running at him as he tries to get Kōji's door open. He quickly realizes he has to silence Kōji—now. He breaks in, finally. Kōji sustains defensive wounds before Rum forces APTX down his throat. Tsutomu then barges in and fights Rum. The fight ends in Rum fleeing the scene. Perhaps Tsutomu leaves Asaka in the lurch, but perhaps he doesn't—the former scenario fits better with Asaka being rendered unconscious by Rum's initial surprise attack, while the latter scenario fits better with Asaka managing to stay conscious longer after Rum's initial surprise attack. As for the Asaka talking with Kōji scenario, this would lead to Asaka putting up a better fight—nonetheless, Kōji would still be forced into his room. When Asaka is finally rendered unconscious, Rum sees Tsutomu running at him. He quickly realizes he has to silence Kōji—now. He breaks in, finally. Kōji sustains defensive wounds before Rum forces APTX down his throat. Tsutomu then barges in and fights Rum. The fight ends in Rum fleeing the scene. In this case, Tsutomu intervening on Asaka's behalf and getting them out of there while they're unconscious fits this scenario better than Tsutomu leaving Asaka in the lurch. As for the Ryuma shogi piece, I believe Rum would've destroyed it had he actually gotten his hands on it—its continued existence would place him at risk. Keeping it around for 17 years seems foolish of him—keeping it around for 17 years and then giving it to Vermouth seems even more foolish of him. If Gin doesn't trust Vermouth's antics, why would Rum, a man Gin seems to respect the authority of, and a man who has gotten Vermouth to back off (yes, Movie 20 isn't canon, but didn't Gosho write that scene—correct me if I'm wrong)? Even if Anokata told Rum she should be allowed to have it, if she was insistent on having it for her plans, her getting her hands on it at all would require Rum to keep it for 17 years—which is very unlikely to me. So if Rum didn't take it, either Asaka or Tsutomu took it. If Asaka were to take it on their own, after regaining consciousness, that decision would be based on impulse rather than cohesive thought. If Tsutomu took it, perhaps he left it with Asaka. Since Rumi has the piece, this line of reasoning lends to the idea that Rumi is Asaka. You can check your PM inbox on DCTP for a more thorough response, but, basically... Other Asaka suspects = Rumi, Muga, Hyōe (or should I say, person who is now pretending to be Hyōe after the real Hyōe died in that accident 10 years ago, assuming that theory is true) If Rumi's not Vermouth, then I see her as someone with a score to settle with Rum, and someone who had to have been at the scene (in order to take the Ryuma shogi piece—take it from Kōji's dead hand, presumably). Ergo, she must be Asaka, or a sixth party (Asaka, Amanda, Kōji, Rum, Tsutomu are the 5 I presume were at the scene on that day) on the scene whose presence we haven't yet been privy to. Just curious, what are your alternatives (alternative theories, that is) to Asaka being Maria and Rumi being Vermouth? In other words, if Maria isn't Asaka, then who is Asaka... and if Vermouth isn't Rumi, then who is Rumi?